The final one is odd in that the character has horizontal symmetry but the “structure pattern” does not. Yay, someone found a use for obscure unicode characters! 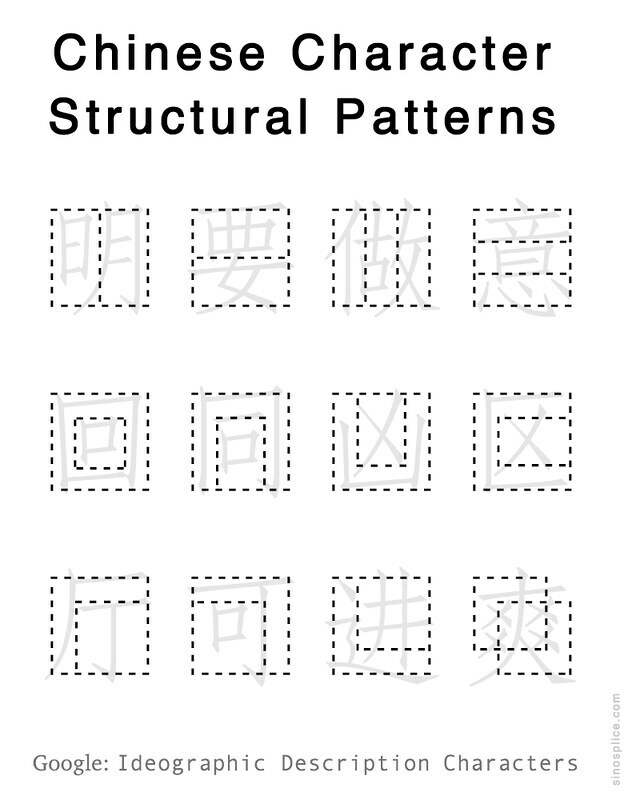 What are more examples of the 12th Structural Pattern? The example given (shuǎng) does not clearly show this make-up. The key to the 12th pattern is that the two parts overlap somewhat. So in 爽, you have the character 大 with these weird X things on either side of it. I admit, some of those (like 果) are a little confusing, and you’d have to really study the evolution of the character to understand what’s really going on. But others, such as 必, are pretty straightforward. Anyway I do know some Chinese characters, as I like to do shopping on taobao. I’ve never thought the characters could be structured in the way as you describe. This makes things much easier with learning Chinese!